Got Buzz @ Kurman Communications: Meet Zullo's Chef Greg Christian at Chicago French Market March 2 at 5:30 p.m.
Meet Zullo's Chef Greg Christian at Chicago French Market March 2 at 5:30 p.m. The Chicago French Market is launching a new series of weekly events called Tuesday Tastings at the Market! Every Tuesday in the public dining area, Chicago French Market will host a different vendor or chef demo and tasting beginning at 5:30 pm. The inaugural Tuesday Tasting kicks off this Tuesday, March 2 with Chef Greg Christian of Zullo's cooking up an organic seasonal veggie pasta! Zullo’s has been a Green City Market favorite for its southern Italian food. Now, those much raved about apple cider donuts are available six days a week at their first permanent location. Pizza, pasta, panini, pastries and soups also will be available. 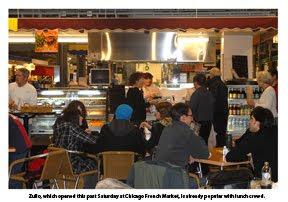 The Chicago French Market is located on 131 N. Clinton in the Ogilvie Transportation Center.